The Minnesota Wild pulled off a big victory Saturday when they defeated the Western Conference’s top team in the Calgary Flames. Not only was it a big win, but with five straight victories, it has propelled Minnesota into the final wild card spot for the upcoming Stanley Cup playoffs, something that seemed unlikely just a week ago. Suddenly what looked to already be a contentious race for the final playoff spot, it has become even more muddled as four teams are vying for the final two wild card spots. The Dallas Stars currently hold the first wildcard spot in the Western Conference with 71 points, while Minnesota owns that second spot with 70 points. However, two other teams are right there, including the Arizona Coyotes who have 69 points, while the Colorado Avalanche have 68 points. Dallas is the most interesting team as they were buyers at the trade deadline, picking up defenseman Ben Lovejoy and Mats Zuccarello. However, while Zuccarello looked to be a good fit who energized the Stars’ struggling second line after posting a goal and an assist in his first game, he broke his arm late in that first game after blocking a shot and will now miss at least three more weeks. That hasn’t stopped the Stars, however, who have won two in a row and three of their last four. The Coyotes have also been red hot, having gone from a team that had almost no chance at a playoff spot earlier this year to a team that has won six straight and nine of their last 11 games and actually could catch the Vegas Golden Knights as they are only four points behind them in the Pacific Division. All of this is with a gluttony of injuries to Coyotes’ players. The team is expected to get Jason Demers back from injury on Tuesday and could get Michael Grabner back within the week. Throw in the impressive play of Darcy Kuemper in goal and the team has been hard to beat. Colorado is the forgotten team, who early on seemed to be the obvious candidate to seize the third seed in the Central Division, but the team bottomed out, struggling immensely throughout December, January and part of February. However, the Avalanche have won six of their last nine and look to be fighting their way back into the playoffs. Armed with some of the best players in the NHL in Nathan MacKinnon and Mikko Rantanen, the Avalanche have every chance to force their way back into the playoffs. So, which team has the best chance to claim a spot in the Western Conference playoffs? Pro Hockey Rumor app users, click here to vote. There was more than a bit of scrutiny and criticism when Anaheim Ducks GM Bob Murray named himself interim head coach despite not having any coaching experience. Yet, Murray’s first game behind the bench last night was the Ducks’ first win in weeks. A shutout performance by Kevin Boyle played a major role, but USA Today’s Mike Brehm writes that Murray’s presence made an obvious impact. Anaheim came out hot, scored early, and played with energy and aggression that they haven’t displayed during this disappointing stretch. Brehm advocates that all NHL GM’s consider spending time as a coach following a coaching change, as he feels the pressure and seriousness that Murray brought to the Ducks’ locker room was the reason for their sudden change of spirit. The next question, of course, is how long Murray’s role as coach can maintain this level of play. Another coach is trying to motivate his team a different way, one that required some boldness. Appearing on KFAN radio in Minnesota today, Wild head coach Bruce Boudreau guaranteed his team to make the playoffs. Yes, you read that correctly. It’s not often that anyone on a team offers up such a prediction, never mind the head coach, but the veteran Boudreau apparently feels confident and surely wanted to energize his players. “I can tell you right now”, Boudreau proclaimed, “we’re going to make the playoffs. And we’re going to be somebody hard to deal with.” It’s big talk from the Minnesota bench boss, but can he back it up? The Wild are currently clinging to the final wild card spot in the Western Conference, having picked up just one win in the past seven games, but still hold a two point lead over the Vancouver Canucks with a game in hand, with several more teams right behind. Minnesota also stands little chance of climbing further up the standings, as the Dallas Stars and St. Louis Blues have played their way to solid leads over the Wild. Boudreau has consistently qualified for the postseason during his long career as a head coach, but with one seed up for grabs and arguably seven teams within striking distance, it could be a tall task for the Mikko Koivu-less Wild to hold on. BSN Denver’s A.J. Haefele reports that the Colorado Avalanche have had discussions with the Ottawa Senators about impending UFA trade target Mark Stone. It’s unclear how far back these talks were, but it seems very unlikely that the two sides are still talking given that GM Joe Sakic has made it clear that his first-round picks and top prospects are off the table at the deadline. Haefele himself even doubts that a deal is made. However, if Stone doesn’t end up re-signing in Ottawa, the Avs could circle back on their interest this summer when the world-class winger likely hits free agency. With Nathan MacKinnon and Gabriel Landeskog signed long-term to below-market deals, Colorado could more than afford to bring in Stone while also extending Mikko Rantanen. Stone may be eager to join the Avs, who have top young offensive talent and a treasure trove of promising prospects still to come. It’s an interesting possibility to consider in a few months time. A journeyman forward who has suited up for the Ducks, Wild, Avalanche, and several other NHL teams in his career is hoping to make a comeback. Sportsnet’s Elliotte Friedman hears from brother Anthony that Chris Stewart is gearing up for another try at an NHL contract this off-season. A veteran of 652 NHL games, Stewart played for the Wild and Calgary Flames last year, recording 16 points in 54 games. The physical winger has tallied 321 points to go with 729 penalty minutes in the NHL, but is looking to add more. Although he had PTO offers from the Boston Bruins and Toronto Maple Leafs this off-season, per Friedman, Stewart instead chose to spend the year training in England and has played a handful of games with the Nottingham Panthers of the EIHL. Stewart, still just 31, could have a chance to land a contract, or at least a PTO, next season due to his reputation for physicality, his work ethic, and his ability to be a difference maker along the boards. If something doesn’t change soon, the Colorado Avalanche could be out of the playoff conversation by the time the NHL Trade Deadline rolls around in two weeks. The team is on a seven-game win-less streak and have only won three of their past 20 games dating back to before Christmas. The Avs are currently in tenth in the Western Conference, four points back of the Minnesota Wild for the final wild card spot. The team that looked early on like a safe bet to earn a Central Division slot is now in real danger of missing the postseason completely. With this struggle also comes an increased risk of being a buyer at the deadline. While the young Avalanche were not expected to be a heavy presence on the market regardless, they may be scared away from moving trade capital at all with their postseason hopes in a downward spiral. As such, if Colorado wants to improve their play and try to get back into playoff position, that help will likely have to come internally. The first move in that direction may have come today, as the Avalanche have announced the recall of young forward Tyson Jost from the AHL’s Colorado Eagles. Jost, 20, was the tenth overall pick in 2016 by the Avs after scoring more than 100 points for the BCHL’s Penticton Vees the season prior. He was then a point-per-game player in his first and only season with the University of North Dakota. However, Jost has been unable to find that kind of production and consistency in the NHL. Last season, Jost recorded 22 points in 65 games for the Avalanche, which was not terrible for a rookie, but was underwhelming considering the ice time and situations Jost found himself with. The young center then landed in the AHL last month after registering just six goals and 15 points in his first 43 games. Rather than let the demotion affect his play, Jost has put together four goals and an assist through eight games with the Eagles and has even fought back from an injury earlier this month that was expected to keep him out an “extended period”. All signs point to Jost being determined to get back to the NHL and be a difference-maker, which is exactly what the Avs need. Colorado is still a top ten team in goals per game, but drastically needs improved secondary scoring behind their dominant top line of Nathan MacKinnon, Mikko Rantanen, and Gabriel Landeskog. If Jost can be the spark that gets some offense going in the bottom-nine, that could be enough to get the Avalanche back to their winning ways. The team’s next five games are against current playoff teams, so we’ll soon see whether the talented young forward can be an x-factor for Colorado down the stretch. In his most recent 31 Thoughts column earlier this week, Sportsnet’s Elliotte Friedman mentioned that now-former Edmonton Oilers general manager Peter Chiarelli was close to making a blockbuster trade back in 2016, just days before he traded Taylor Hall to New Jersey for Adam Larsson. Friedman, however, had no knowledge of the details of that blockbuster. However, New York Post’s Larry Brooks got a confirmation from multiple sources that the trade would have been with the New York Rangers. Brooks reports that just before pulling the trigger on the Hall-Larsson deal, Chiarelli was close to a deal that would have sent the 2016 fourth-overall pick (used to take Jesse Puljujarvi) to the Rangers for defenseman Ryan McDonagh. The belief is that New York was interested in drafting Clayton Keller of the U.S. National Development Team with the fourth pick to begin the rebuild process then. Brooks adds there were other pieces to the deal, but points out that after the team’s first-round exit to Pittsburgh that year, the team felt it needed to re-tool their team with McDonagh being the most marketable player on the Rangers at the time. Instead, Chiarelli turned the deal down, took Puljujarvi and sent Hall to New Jersey for Larsson, while the Rangers instead packaged Derick Brassard to Ottawa in a deal to get Mika Zibanejad. The team did discuss McDonagh with other teams at that time, including a deal with Colorado for either Nathan MacKinnon or Gabriel Landeskog, but the Avalanche weren’t that high on McDonagh’s value. Considering how Puljujarvi has turned out in Edmonton thus far and how successful Hall has been since leaving the Oilers, the trade could have altered the outcome for Edmonton as well as Chiarelli, as McDonagh could have helped stabilize the team’s defense. However, there is no guarantee that Chiarelli still wouldn’t have moved Hall later on anyway. Of course, the Rangers team may look quite a bit different with Keller on their team now as the 20-year-old put up a 23-goal, 65-point campaign in his rookie season last year and currently has 11 goals and 35 points this year and would have been a great piece to build around. Instead the franchise held onto McDonagh until last year’s trade deadline when they sent him and J.T. Miller to Tampa Bay in exchange for Vladislav Namestnikov, propects Libor Hajek and Brett Howden as well as a 2018 first-round pick (Nils Lundqvist) and a conditional 2019 second-rounder. With the trade deadline fast approaching, we will be taking a closer look at the situation for each team over the coming weeks. Where do they stand, what do they need to do, and what assets do they have to fill those needs? Next up is a look at the Colorado Avalanche. The Colorado looked to be clearly the third best team in the Central Division until recently, but the team has struggled in December and even more so in January with a record of 7-14-3. However, despite that, the team has 52 points, tied with Dallas and is right in the mix for a playoff spot. However, despite their top line and team’s surrounding success over the past couple of seasons, the team is continuing build their team and remains a young squad. The team has the Ottawa Senators’ first-round pick in 2019 which could provide them with a superstar prospect and general manager Joe Sakic has made it clear the team isn’t going to trade away future assets to add temporary help for this team. It’s actually hard picturing the Avalanche selling anything from their team as well, but they do have some assets they could move in the right deal. While the team might never consider to move Ottawa’s No. 1 pick, they might be more open to moving their own first-round pick, which would likely be late lottery to mid-level first-rounder. However, among current assets, the team could consider moving some of their unrestricted free agents like Colin Wilson and Patrik Nemeth, two players who the team must decide whether they intend to keep them after this season. 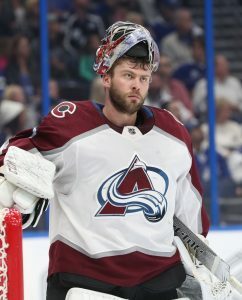 The team also is likely to lose starting goaltender Semyon Varlamov in the offseason after picking up Philipp Grubauer, so the team could consider sending Varlamov off to a team in need of a rental starter, although it’s far more likely the team will keep Varlamov for the remainder of the year in hopes of pushing for a playoff spot. 1) Secondary Scoring: The team’s top line of Nathan MacKinnon, Mikko Rantanen and Gabriel Landeskog has been impressive all year, but the team needs to build up their second line and has received little help from any of the players they have put there other than Carl Soderberg, who was meant to be more of a third-line player. Prospect Tyson Jost was sent to the AHL to work on his game, while many of their other young talents like J.T. Compher and Alexander Kerfoot haven’t shown enough consistency so far. The team could use a solid impact player that can be the offensive focus of the second line. Whether the team is willing to pay for that at this point in the team’s development is another question. 2) More young talent: One thing that Sakic has done over the past few years is he has avoided handing out too many bad contracts with the possible exception of defenseman Erik Johnson’s seven-year, $42MM contract he signed back in 2015. In fact, the one given to MacKinnon seems like a bargain at $6.3MM for another four years after this one. While the team will have to lock up Rantanen this summer, the team has an awful lot of cap space they could use to bring in future assets. They did this last summer when they took on the contract of Brooks Orpik and was able to bring in Grubauer to help the team in goal. They could be that team that helps some of those cap-challenged teams to bring in more picks or young players to further invest in Colorado’s long-term development. Saturday: MacKinnon has officially avoided the worst-case scenario, NHL.com’s Amalie Benjamin reports. MacKinnon did not suffer a broken left foot, but does have a major bruise on the inside of the foot. The Avalanche pivot called it “sore” and “swollen” and did not want to test it this weekend. Colorado is likely in agreement with that judgement call. They are likely to have MacKinnon back in the lineup following their upcoming “bye week”. Friday: MacKinnon is flying to San Jose later today according to Elliotte Friedman of Sportsnet. The Colorado center is unlikely to participate in any on-ice events. Thursday: It isn’t clear right now to what extent his foot his injured – so no cause for alarm yet Avalanche fans – but Nathan MacKinnon is set to undergo an MRI on his foot, per Sportsnet’s John Shannon. Shannon reports that the Colorado Avalanche are being cautious about a possible left foot injury and want to get a better sense of their superstar center’s health. Shannon adds that, regardless of the MRI results, MacKinnon could miss this weekend’s All-Star festivities in order to rest. No one can blame the Avalanche for taking any health issue with MacKinnon seriously. The 23-year-old has accrued 71 points already this season and is on pace to shatter the career high of 97 that he set last year and that nearly won him the Hart Trophy. MacKinnon centers the top line with Mikko Rantanen and Gabriel Landeskog that is responsible for a higher percentage of their team’s production than any other line in the NHL. A long-term MacKinnon absence would be devastating for a Colorado team that is already slumping; the Avs have won just three games in their last 15 and are one loss away from falling out of a playoff spot completely. They need MacKinnon now more than ever. With that said, this seems to be purely cautionary, especially given Shannon’s insistence that sitting out the All-Star Game may be the only measure taken to ensure MacKinnon’s return to full health. The franchise center also logged approximately 21 and 19 minutes of ice time in each of his past two games and did not look uncomfortable. Perhaps this is just a minor nagging injury the team wants to look at – MacKinnon did suffer a foot fracture back in 2015 – or perhaps he was simply sore after an incident in last night’s contest against the Minnesota Wild and wanted to get checked out. Either way, this is news simply due to MacKinnon’s name value but right now does not look like anything major worth worrying about. The biggest concern may actually be who replaces the Central Division captain at this weekend’s All-Star festivities. TSN’s Pierre LeBrun reports that MacKinnon is still expected to be in attendance in San Jose, but would need a substitute if he cannot compete. With both Rantanen, an original selection, and Landeskog, the Central’s winner of the “Last Men In” fan vote, already going, it’s very unlikely that MacKinnon would be replaced by another Avalanche player. Other popular “Last Man In” candidates like the Winnipeg Jets’ Patrik Laine, the Minnesota Wild’s Zach Parise, or the Nashville Predators’ Filip Forsberg are possibilities to get the call if MacKinnon is unable to participate. The 2019 NHL All-Star captains have been revealed today, and there will be a nice mix of old and new leading the way in the mid-season tournament. Auston Matthews, Alex Ovechkin, Nathan MacKinnon and Connor McDavid will captain their respective divisions after outstanding starts to the year. The players were selected through fan vote. Matthews is perhaps the most surprising, given that he has missed a good chunk of the season with a shoulder injury. Still, the young Toronto Maple Leafs star has 19 goals and 34 points in 23 games and is an obvious choice as a player to market in the United States. Born in California and raised in Arizona, Matthews is a perfect poster boy for the idea that anyone can learn to play and excel at hockey regardless of their background. McDavid and MacKinnon were easy choices after starting the year on fire once again, and are arguably the two best young players in the league today. The pair of Canadian centers should compete again in the fastest skater competition, given the incredible speeds they operate at every night. MacKinnon’s linemate Mikko Rantanen may have a bit of a bone to pick with him, given that the talented winger is actually leading the league in scoring. No one should be surprised by the fact that Ovechkin can still hang around with these young stars, but it is still impressive just how well he has performed this year. In a season that some expected a “Stanley Cup hangover,” the great Washington Capitals forward leads the league in goals with 29 through his first 35 games and may very well win the eighth Maurice Richard trophy of his career. Now 33, there’s no slowing down the Russian sniper who has a whopping 21 goals at even-strength. With leading scorer Matt Duchene on injured reserve and expected out for “weeks”, what little chances the Ottawa Senators had of making the playoffs this season are likely to slip away. This was always the expected result of the 2018-19 season for Ottawa, but their efforts thus far to stay out of the basement of the NHL have surprised many and inspired some. However, as reality now begins to finally set in, the team must decide what they want to do with Duchene and fellow impending free agents Mark Stone and Ryan Dzingel. As Ken Warren of the Ottawa Sun writes, Duchene – currently tied for ninth in the league in scoring – will likely ask for an eight-year deal in the ballpark of $60-70MM to remain in Ottawa, reflective of the salary he will likely command on the open market. Stone will be in the same neighborhood, with Dzingel significantly lower albeit not cheap by any means, but the Senators cannot even begin negotiations with the pair until the new year, per the rules pertaining to their recent salary arbitration decisions. As such, the team is dealing with three high-quality expiring assets without any guarantee that they will be re-sign or if the team will be willing to meet their salary demands. In a season in which Ottawa could finish with one of the worst records in the league but lacks their first-round pick – given to the Colorado Avalanche in the deal that landed Duchene – it stands to reason that GM Pierre Dorion will strongly consider recouping as much trade capital as possible if extensions are not in place by the trade deadline. Given the uncertainly surrounding the ownership status of Eugene Melnyk, whose tactics thus far leave much to be desired anyway, Warren believes that Duchene, Stone, and Dzingel, as well as any other free agent in the coming off-season, will think twice about a future in Ottawa. All things considered, it’s beginning to look like the trio stand a better chance to all be traded away in the coming months than any of them do of signing a long-term extension. The Athletic’s Graeme Nichols wonders if yet another Senator is prime trade bait right now as well. With veteran goaltender Craig Anderson playing his best hockey of the season so far, Nichols opines that Ottawa would be best-served to try moving their starter while his stock is high. While the recent home-and-home series with the Montreal Canadiens did not go so well, Anderson did look very good in wins over the New York Rangers and San Jose Sharks prior, recording 63 saves on 65 shots over the two contests. Anderson also made 48 saves against the Dallas Stars last month and notched wins over the Tampa Bay Lighting and Pittsburgh Penguins. Admittedly, even as this best, Anderson is still a 37-year-old replacement-level goaltender at this point in his career and won’t command much of a return. However, the Senators’ season is sinking and they should get what they can while his value is potentially at its peak. The knock on moving Anderson this season has been that Ottawa has no suitable replacement – backups Mike Condon and Mike McKenna have performed very poorly in limited appearances – and thus trading Anderson means giving up on the season. Yet, with Duchene out long-term, any postseason hopes will fade and moving Anderson will begin to make more sense. As Nichols recalls, Anderson himself also alluded to a desire to move on from Ottawa this summer, so making a deal seems to be in the best interest of all parties. There are plenty of teams out there who would be intrigued by adding an established veteran in net this year and Anderson could soon fill that role. The Chicago Blackhawks made it known yesterday that they are looking to move out some of their defensive depth, but NBC Sports’ James O’Brien asks if they are focused on the wrong players. Rather than try to flip the likes of Brandon Manning or Jan Rutta, for which they would receive relatively little, O’Brien believes that the team’s long-term needs would be better served by trading away a mainstay like Duncan Keith or Brent Seabrook. This is not so cut-and-dry, as O’Brien admits, but would be worth looking into. Both players carry no-trade clauses that Chicago GM Stan Bowman would first need to ask them to waive. Even if Seabrook was to agree, it seems very unlikely that Bowman would find a taker for the depreciating defenseman and his albatross of a contract. If by some chance he does, it would be a small return similar to Manning or Rutta, but with a far greater salary cap relief. Keith is another matter; while not what he once was, the 35-year-old is still a very capable defenseman who would play in the top four for nearly every team in the NHL, at least for now. The worry is that Keith will continue to age and his ability will fall off, while the Blackhawks continue to pay him more than $5.5MM per year and rely on him for top minutes. Removing that crutch (and cap hit) now, in what appears to be another lost season for the team, would give Chicago a strong return that they could use to begin rebuilding the team. The alternative, which also appears to be the current plan, of waiting for the current roster to turn things around, will only increase the risk of injury or drop-off from Keith while damaging his market value as he ages. A move now would be painful to the fan base in the short term, but the right move looking toward the future. One team who could be a dangerous player at the trade deadline this season are the Colorado Avalanche. Per CapFriendly, the Avs are currently projected to have more than $56MM in cap space available at the deadline, or in other words have no limit to the amount of talent they can bring in if they so choose. Colorado is currently tied for the lead in the Central Division with the Nashville Predators and could even emerge as President’s Trophy threats this season. Armed with the best line in the NHL, including the top two scorers in the league, Mikko Rantanen and Nathan MacKinnon, and the best power play as well, the Avalanche are second in goals for per game among all teams. They also play well in their own end, seventh in goals against per game behind the efforts of Semyon Varlamov. Yet, the Avalanche are not without fault and could stand to add a contributor or two both on defense and up front. The team was expected to add top prospect Cale Makar to their blue line by the end of the regular season, but with his college squad, the UMass Minutemen, ranked No. 1 in the nation, Makar could be occupied through the Frozen Four tournament in mid-April. A capable puck-moving defenseman should thus be at the top of the list for Colorado, followed by an injection of offensive ability and two-way accountability among the forward corps, where their secondary scoring and penalty kill could both use work. While the matter of cost in trade capital is another question entirely, the Avalanche will have the cap space to hypothetically address their needs by adding the likes of Jordan Eberle, Kevin Hayes, and Jay Bouwmeester for example. That’s a dangerous premise for other contenders to consider as Colorado continues to excel this season.